Saturday at Gallery F – Theatre Intangible Live! Hydractinia symbiolongicarpus colony. 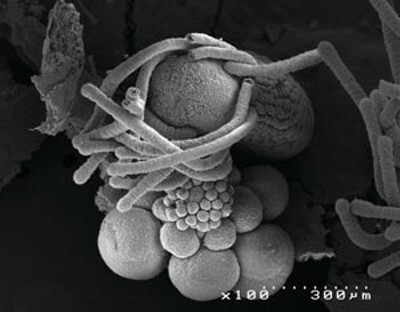 Scanning electron micrograph. Hard to believe that Scarritt Bennett Center’s Gallery F has only been open for three years. In that short time, they’ve meditated on the Japanese earthquake, danced and wallowed in unrefined oil, raced paintbrush-armed robots on a paper floor, exhibited cutting-edge artists, premiered experimental dance and music performances, housed weekly poetry readings, and even chauffeured art-goers between buildings in a go-cart driven by a lounge singer belting out 70′ pop hits. Brainwaves: Ken Soper and Dylan Simon play analog synthesizers with their minds, using two circuit-bent Mindflexes, a ball-levitating children’s toy controlled by the power of concentration. Drawing inspiration from this Robert Schneider hack, Ken and I modified the Mindflexes to output synthesizer-friendly control voltage. This performance will be an unpredictable lab experiment, colliding art with science. Space Waves: A three-piece jazz ensemble inspired by Don Cherry’s world fusion period meditates on the planets in eight vignettes (one for each planet). This trio, comprised of Jamison Sevits on trumpet/flugelhorn, Randy Hunt on upright bass, and Matt ___ on percussion use music to connect the scientific qualities of the planets (Venus as the hottest, Jupiter the largest) with the mythological elements that have inspired centuries of art (Mars the God of War, Nepture the God of the Sea). Art Waves: “Art is made to trouble, science reassures.” — George Braque. Craig Schenker (alto saxophone) and Jamison Sevits (trumpet) perform “Tips,” a series of duets written by Steve Lacy and inspired by the notebooks of painter George Braque. Of the series, Lacy writes, “These are aphorisms, speculations, observations, but especially advice to himself as an artist and to all other artists. . . Last year, I took 14 of these phrases, and set them, in a chosen order, for voice and soprano and alto saxophones. Illustrated by the improvised sections, the result is a sort of ‘casebook cantata’, and a working examination into the nature of free play, in this case between two saxophonists, but also about preparation and spontaneity, and of music and information.” The Gallery F performance is adapted by the performers for trumpet and alto saxophone. Gallery F opens at 6pm; performances start at 7pm. These performances are just one small piece of the hugely-ambitious exhibition. Below are the full details from the Gallery F website. Hope to see you there! This show reveals congruencies between the curiosity and compulsions that drive both scientists and artists. Science and art seek answers to similar questions, questions that stretch our sense of where life and consciousness begin and end. In rendering the invisible visible, the intangible material, art and science give us a glimpse into lives we cannot imagine and bodies we cannot relate to. Both artistic and scientific images are filled with marvel at the phenomena and spirit of life. 7:00p – The music of Theatre Intangible Live featuring three special performances.